An absolute ideal promotional product for promoting your brand at events, shows or for display outside your business. Excellent visibility allows more conversions and customers, with a wide array of high quality premium mounting options, every surface is covered - from concrete to grass and anywhere between. Featuring a large branding area we are able to print your designs for maximum exposure including tag lines, information and logos. 2.5, 3.5, 4.5 - Metres in height. Our high quality printing method allows us to faithfully reproduce photographic print true to colour while also printing full colour complex gradients across the entire flag. With a complete carry case, ground stake and full equipment required for easy set up, the Feather Flag Banner is a must-have option for promoting your business, and is one of the most popular tools for this very purpose. The wind ratings below are a guide only and safety and common sense needs to be applied on very windy days. 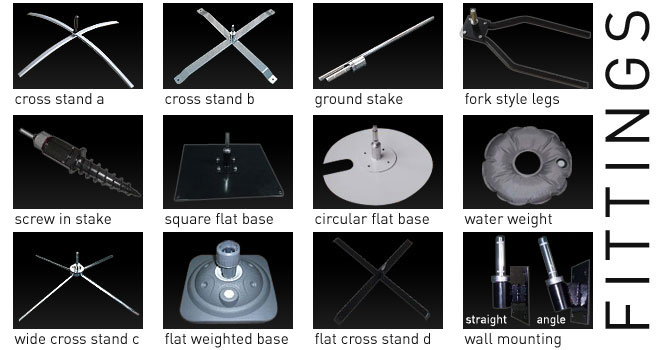 When using a cross stand base we offer an optional water weight. 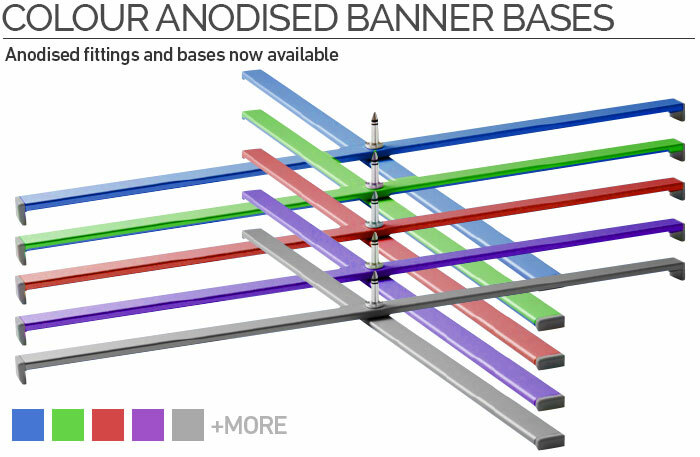 When filled this offers approx 9kg of weight to your banner base, which ads a degree of stability to your banners. Wind ratings with ground stake are dependant on density of ground, and how well the ground stake has been pushed in to the ground. Please remember these wind ratings are a guide and common sense must be applied. *wind ratings are an approximate guide only. Event Display can not be held liable for any damage caused by incorrect fastening of banners or banners that are exposed to extreme winds. More Information About Our Awesome Feather Banners! Marketing remains essential for any business, as word of mouth is no longer enough to bring customers in the door. Competition continues to increase in many industries, and consumers can now buy products and services from around the world. When the time comes to create an advertising strategy, businesses need to use every resource available. Many companies opt to make use of feather banners to draw attention to their brand, as they are simple and catch a person's eye. They may be used indoors or out and come in a variety of styles to meet the needs of all. What do business owners need to know when selecting this marketing item? Businesses often choose feather banners over other advertising options as they tend to be low cost, but don't assume this means they are of low quality. Banners of this type are designed to withstand the elements and have a long lifespan, allowing the company to get the best return on investment. Fading is rarely an issue with feather banners also. Feather banners can be customised with images, a logo, an advertising message, or any information the purchaser desires. In addition, the buyer chooses the colors of the flag. This permits the organisation to choose colours their customers are already familiar with. When combined with the logo on a feather banner, the colours help to catch the eye of those passing by. The banners are easy to use and extremely lightweight. This means they can be moved from location to location as well as set up and taken down with no problems. Businesses find they don't have to purchase multiple marketing items when this one product will work in so many different situations. Companies need to choose a size for their feather banner, and this is a matter of personal preference. When determining this, take into account the information that is to be printed on the banner, the message to be shared, and the logo of the company. Doing so helps to narrow down the available choices. Most flag banners start at approximately two meters and can be as big as five meters, although the price does increase with size. Width is typically determined by the height of the banner as well, so companies need to decide which aspect is more important to them, height or width. 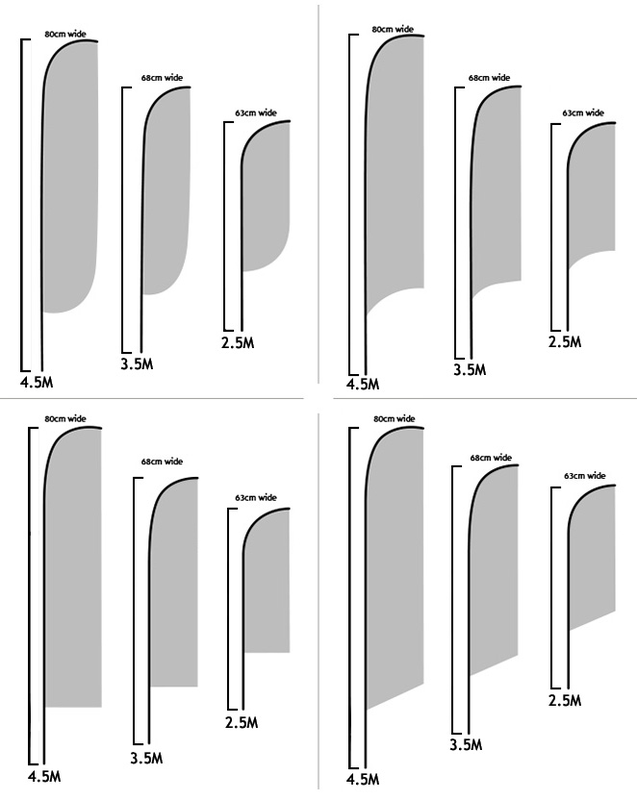 Once the size has been determined, companies need to determine whether they wish to have single or double-sided printing. Many businesses find they prefer the double-sided printing, as it allows their message, logo, or image to be viewed from any direction. Furthermore, this option helps to reduce bleed through of the colors and images and enables a business to put a different message on each banner side. When the single-side printing is selected, the mirror image will be seen on the reverse side. Keep the above in mind when choosing a printing method, as the goal is to increase the visibility of the company. In some situations, single-side printing achieves this goal while, in others, double-sided printing is called for. The majority of feather banners are made using a material that will withstand the elements when used outdoors. Some discount companies, however, make use of a material that is better suited for indoor use and fail to share this information with the customers. If they do so, they put it in the fine print, leaving customers to wonder why their feather banner didn't hold up with time. Storm flag material should be chosen, whenever possible, to ensure the durability and lifespan of the banner, and businesses need to ask if any guarantee is provided on the product before buying. This does not mean the business shouldn't take steps to care for the banner. Any time the banner will not be used to promote the company, it should be stored properly. This includes bringing the feather banner inside when heavy storm winds are predicted. Cleaning the banner requires nothing more than some water and a damp cloth, as these items should remove any dirt or debris that has built up on the banner. Be sure to ask if the banner is machine washable to prevent any damage from cleaning it in this manner. Additionally, the banner should be allowed to air dry as opposed to using a tumble dryer for this purpose. Feather banners have a big impact on consumers, as they remain in position to bring attention to the product or service non-stop. As they can be used in virtually any environment, they are a cost-effective way to get the word out about a company and its offerings. Consider purchasing one or more to add to your overall marketing strategy today. When you see how they help to generate interest in your business, you may find you want to purchase even more. They are a great tool for any organisation.